2018 Best Bassinet for Newborn - Surprised by This Result! Home Best Baby Products 2018 Best Bassinet for Newborn – Surprised by This Result! When it comes to buying a bassinet for your newborn, there are many choices. When you decide you want the convenience of a bassinet, you want to make sure you buy the best bassinet for newborn babies for your little one. Below are three of the most popular baby bassinets. They each have different key features to fit what you are looking for in a bassinet. This bassinet enables you to keep your baby close to you. It can be used as a stand-alone bassinet or attached to the side of your bed as a bassinet co-sleeper. The convenience of this allows you to keep it right next to your bed for easier night feedings and feeling secure that you can be close to your newborn. With a co-sleeper, you don’t have to get out of bed in the middle of the night because you have the convenience of baby being within arm’s reach. Many breastfeeding moms love co-sleepers when it comes to the middle of the night feedings. It has breathable mesh on the sides that provide ventilation. The mesh also helps there to be maximum visibility for a 360-degree view. This bassinet comes with a waterproof mattress, one sheet, and straps for the optional use of securing it to your bed. It also has a roomy storage basket on the bottom. One of the great things about this model is that it has adjustable legs so you can get the height you want. It also has caster wheels so you can roll it throughout your house. Lots of mothers who have gotten the Clear-Vue Co-Sleeper say that they do not know what they would do without it and consider it the best bassinet for newborn. Many parents, who have gotten this bassinet for their second child, say that they wish they had gotten one earlier when their first child was an infant. You need a screwdriver to assemble it, and many parents are saying that putting it together takes about 20- 30 minutes. Once put together, The Clear-Vue Co-Sleeper is not easily taken down and is not able to fold up for travel. It is designed for use by babies up to five months. If a baby is able to push himself up on his hands and knees then it is time to move to a crib, as this will create a danger of tipping over. 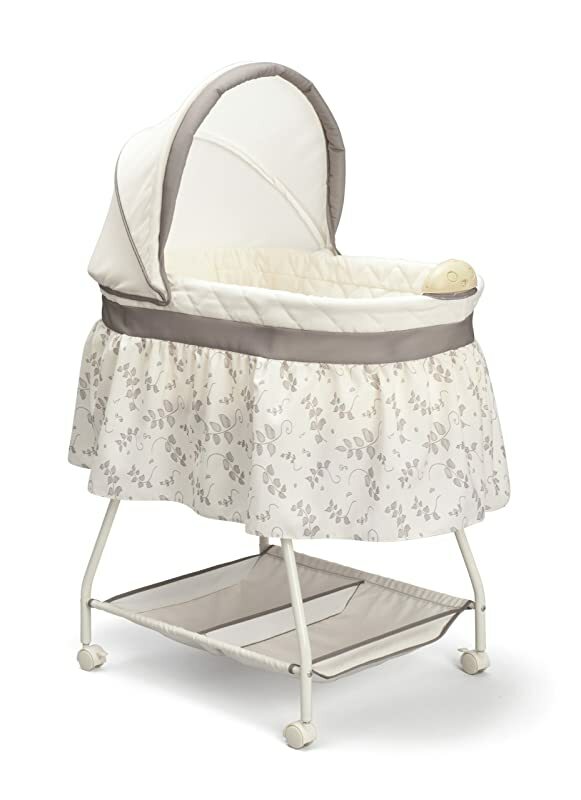 You can find more information about this bassinet (Price, Buyers reviews, …) here! The Karley Bassinet has several features that parents look for when searching for the best bassinet for newborn. It comes with a double canopy that zips up, which is great for anyone wishing to keep pets from jumping on their baby or keeping mosquitoes and other pests away. The double canopy has mesh, so you can still see your little one. Neither of the canopies is removable. This bassinet is lightweight and easily portable. The thing that sets this bassinet apart is that it folds up and is great to take it on trips. Several parents love how this bassinet easily collapses for travel. The drawback of it being lighter weight is that it only has a weight limit of 10 pounds. The Karley Bassinet is great for small spaces. Many parents report that it is a good height and depth for reaching their little one without having to bend too much or strain. It is made with polyester foam fabric, and it comes with a mattress pad. The fabric is made of a material that is easily cleaned. It comes in five color combinations: light blue, aqua blue, pink and gray, pink and rose. This bassinet requires light assembly, which according to users only takes about five minutes with no tools or extra screws necessary. You can find the price of this bassinet here! The Sweet Beginnings Bassinet is an attractive, classically styled bassinet. It has a simple design with gender-neutral colors featuring a white background with a taupe leaf pattern. This bassinet comes with a removable canopy, a unit that plays a selection of lullabies and a nightlight. It has a mattress pad and comes with a fitted sheet. The bassinet’s fabric is machine washable. On the bottom, it has locking caster wheels that allow the bassinet to be moved from room to room. 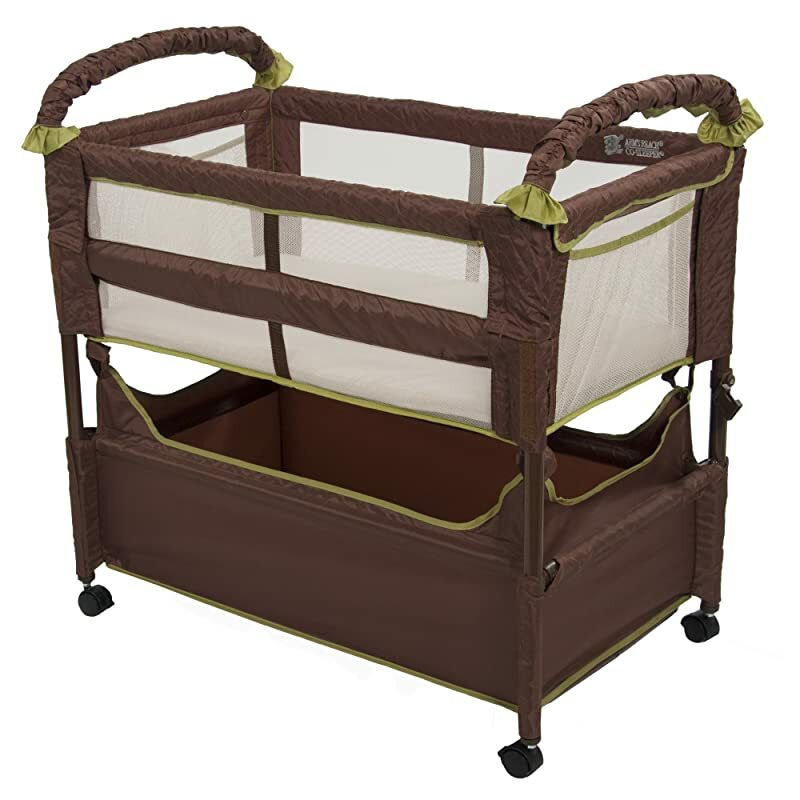 It features a large two-section storage basket that is great for storing extra diapers and spare blankets. It is also worth noting that the top portion can’t be separated from the bottom frame. It has a lightweight frame, yet is sturdy and stable. This bassinet is made for infants who weigh up to 15 pounds. Using this weight, the average infant will need to switch to a crib between three to four months. It takes about 30 minutes to put this bassinet together. Many parents comment its ease of set up. The sides do have breathable mesh under the ruffle. The canopy can be adjusted to block overhead light. Parents praise the convenience of the nightlight during those middle of the night feedings and diaper changes. 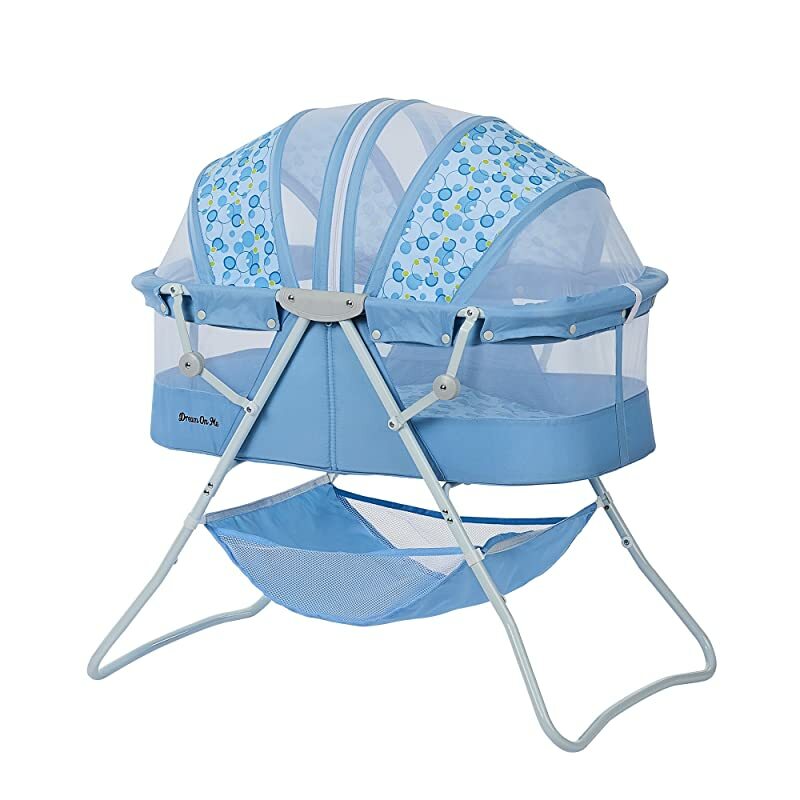 However, the music module that the bassinet comes with plays, which plays simple lullabies that are meant to be soothing, has many customers commenting about the lack of volume adjustment options and the music being too loud. The Sweet Beginnings Bassinet meets or exceeds ASTM and CPSC standers and JPMA certifications. Many parents are saying great things about this bassinet’s economic pricing and are calling this a great value, which is why it tops many lists as one of the best bassinet for newborn.